“Eggs Mignon,” one of the most perplexing and rewarding and tricky hors d’oeuvre in the history of food, lend themselves, once mastered, to a variety of “fillings”. Illustrated on the reverse of this card and described below are assorted fillings for Eggs Mignon, egg white shells (as pictured), and a variety of other good things to eat. Stuff eggs with canned pâté de foie gras, or with any of the creamy pâtés included in this set (See Index), such as the Curried Tuna Pâté on card 207. Purée breast of chicken (cooked) and moisten with mayonnaise; flavor with minced fresh tarragon or dried tarragon leaves. Use early or baby peas; cooke and purée with small amount of dairy sour cream to moisten. Stuff eggs with any of the assorted flavored butters included in this set such as Anchovy Butter (card 280) or Salmon Butter (card 128). Flavor puréed vegetables with curry powder to taste; canned “baby food” vegetables are appropriate for this purpose. See cards 111 and 158 for recipes for Eggplant Caviar suitable for stuffing tin Eggs Mignon. Use deviled ham, beef, corned beef, chicken, etc. Gently fold red or black caviar into dairy sour cream and stuff into eggs. I will, at some point, add the recipes for the referenced cards. First I have to get past the suggestion that I cook with baby food. This is so frightening and revolting, hilarious and tempting all at the same time that I don’t even know where to begin. 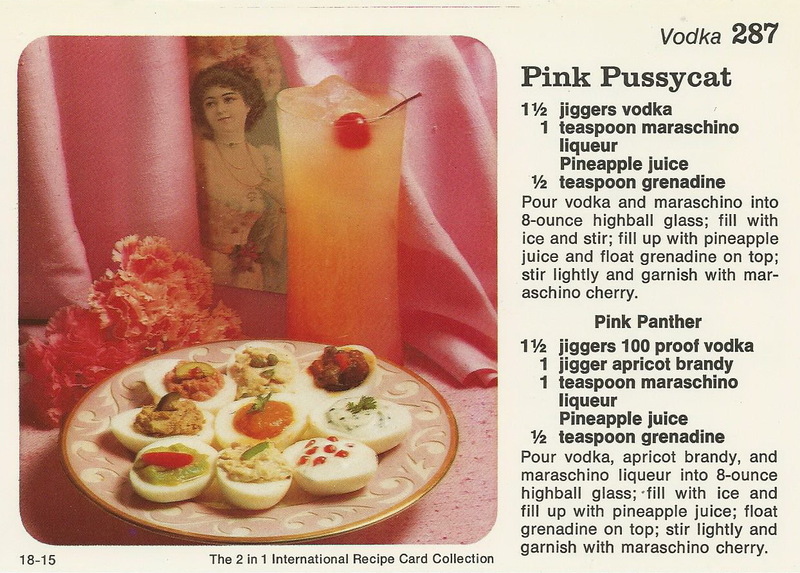 Were these innovative variations on deviled eggs supposed to be served with the Pink Pussycat? A few more jiggers of vodka for me please to wash all that down. From Provençal Caviar to baby food. What on earth were they thinking back in ’77 at Random House? Those must have been some wild office parties. Sorry I missed them. And I would love to get my hands on some of that Maraschino cherry liqueur. Fascinating! Great blog, just discovered it! Funniest thing ever, I can actually see my Mother making these in the 70’s.